One day in the early 1980’s Nirankar Kaur was keeping an eye on a group of kids at a playground in the city of Los Angeles. She spotted one five year old boy leave the pack. He plucked a single flower from a flower bed. He walked over to a man sitting on the edge of the playground with his back to Nirankar. The little boy offered the flower to the stranger at first startling him. Then he walked back to join his playmates. The boy’s name was Hargobind Singh. On September 12th, 2017 around 7:50am Hargobind breathed his last having lived for over two and a half years with Glioblastoma, a terminal brain cancer. I have spent the last five years in close proximity with Hargobind Singh. He married my youngest sister-in-law. A few weeks before his departure I had the idea to interview Hargobind about his life story. I knew we had little time left together. I asked for his permission. He agreed and I wrote a series of questions for him to respond to. The growing cancer had impacted Hargobind’s short term memory. His energy levels were low. His waking hours were dwindling slowly. This was lesser of the challenges. Hargobind had a proclivity to be very reserved. He was stingy with words. He kept the book of his life closed most of the time. A few words about the title. Hargobind was a voracious reader of things fantastical, science fiction, flora and fauna, nature and preservation. Moments when Hargobind broke ranks with his quiet ways were in some instances to correct or enlighten those in his company with facts. A few weeks ago my wife was talking about how his nails had grown really long. He proceeded to educate her about how the nails grow faster in summer. My wife was a little skeptical so she went to the gods at Google. Lo and behold Hargobind was right. This was the case most of the time. Hargobind was a walking wikipedia with a killer stash always gelled up ready to catch the signals from outer space. Here are some Hargopedia facts from his life. Hargobind was born to a Jewish convert to the Sikh faith and a Punjabi father. His father Harkirat reminisces about spotting this young white woman reading Gurmukhi and speaking in Punjabi. Sat Anand Kaur previously known as Nancy Nepon spent many hours with new Punjabi immigrants learning Punjabi. Bibi Inderjit Kaur related this at his memorial service, “Sat Anand Kaur while she carried Hargobind in her womb, spent most of her days reciting hymns from the Sikh faith”. When Hargobind was about a year and a half she had injured her leg and was on crutches. She insisted to be taken across the globe to Darbar Sahib in Amritsar. Harkirat tried to talk her out of it and asked her to recover first. But she was not having any of it. The mother and father along with their toddler son flew over to pay obeisance at the holiest of Sikh houses of worship. Few months later Hargobind was accompanying his mother and few other members of the Sikh sangat to New Mexico in a two cars. The car in the front was involved in a fatal crash with all the adult occupants killed. The sole survivor was the two year old Hargobind with his mother’s body shielding him entirely. A kirpan pierced Hargobind’s spleen which was removed subsequently by doctors at the hospital. Hargobond’s father married another Sikh woman about a year and a half later. Hargobind grew up in Los Angeles with his parents and younger brother Gurmukh and sister Manjeet. I asked Hargobind about some of the most memorable moments in his life. He mentioned two. The first was his most proud accomplishment in life. He built a big kirpan with his own hands. Under the friendly guidance of Uncle Steve he became an apprentice using metal and spare car parts to mold a three feet sword. The second happened a few days after the tragedy of 9/11. While driving on a highway with windows rolled down Hargobind had his hand sticking out resting on the door. He spotted a car tailgating him. The car then came on either side. Eventually the driver came in front of his car. A little while later police cars with signs blaring pulled Hargobind over. He remembered six cars. Police officers came out with guns blazing. He was asked to throw his car keys out of the window. Then he was instructed to step out with hands above the head. He was finally asked to land on his knees and handcuffed. The officers went through the contents of his car. They found his collection of gatka props. Cops brandished his swords out on the highway. He was on his knees for hours. He remembers his right leg cramping but he could not get up. A cop told him to let passing drivers know they were shooting a film. I was angry for Hargobind. I wanted to detect traces of anger from Hargobind but there were none. Hargobind did not report this to any media. A member of the local Sikh sangat was able to connect with the police leadership and get an apology. Hargobind was one of the healthiest person you ever met. He was an active hiker for most of his adult life. He was in great physical shape and does not remember ever visiting a doctor. He came home from work not feeling well. He was weak kneed. He puked a little. He reported a headache in the back of his head. That last observation was odd. I called my sister-in-law who is a physician. She asked me to dial 911. Twelve hours later Hargobind was in back to back surgeries for ten hours to remove a golf ball sized tumor from the right half of his brain. The diagnosis was terminal brain cancer. Hargobind will go through eight surgeries to remove tumor re-growth, add a shunt to drain fluids from his brain to the stomach and have a artificial skull inserted. One of these surgeries last year included a trial therapy utilizing an injection in the brain. He came out of surgery without the use of the left side of the body. A stroke threw one of the meanest curve balls at Hargobind. He went through one of the most difficult moments of his life. Things we take for granted became impossible. He could not urinate or defecate for weeks on his own. He had to accept that nurses, aides and eventually his father-in-law, his wife, me, his sister-in-law will assist him in these tasks. The privacy of his body was not private anymore. He fell many times in the coming months. Amazingly he always landed on his rear never hitting his head. Somehow he managed to control his body to soften the landing. We suspected years of gatka (Sikh martial art) training was coming in handy in these precipitous moments. Hargobind is known across the United States for his gatka skills. He was a master of this battle form. He has trained countless young Sikhs in this art. Hargobind was named by his mother after the sixth Guru of the Sikhs, Hargobind Sahib Jee. The sixth Guru introduced Miri-Piri as a way of life for Sikhs. Hargobind lived the instruction of his name-sake to the fullest. As he faced off Glioblastoma, gatka remained a part of his life even after the stroke took control from his left side. He did gatka through fields of neurons in his cranium. I wanted to know what thoughts were swirling in his head after the MRI following the last surgery which divulged the tumor was growing back. Hargobind wanted to live. He was not ready to go. I took him back to the past. Tell me about experiences that stand out. Going to Sikhi youth camps in New Mexico were one of the most formative times of his life. Military academy for high school years gave him a discipline he incorporated for the rest of his life. Attended the first concert in 1991 with Guns and Roses. Volunteered for Sierra Club as the only youngster surrounded by folks way older than him. First year of university abroad at Khalsa College in Amritsar took him back to the city his mother felt intense connection with. Took Amrit (baptized) in 2002. Marrying into the loud warm hospitable British Punjabi family added quite a flare into his life. Leaving his hometown, the city of angels for New York City was one of the biggest forks in his journey. Hargobind spent hours exploring the graffiti art in the city. He roller bladed miles into Central Park. Hargobind was a self photographer. He loved capturing himself with his smartphone camera. He is very well documented from his early to late days. The final question I posed to Hargobind. Is there anything or anyone you would like to extend your gratitude towards? He responded with a list. My neighbor in LA from childhood, Narayan Singh. He was like an older brother to me. He took care of me when I was at camp. My friend Steve. He helped me make my kirpan. Whenever I needed to talk to anyone he was there. From high school till now. Kirtan Singh. Positive influence on me. Him and his wife did not have kids. They took care of me as their own. Guru Lal. Friends father in high school. He included me in his family gatherings. Nirankar Kaur. A family friend. Helped raise me. She was a teacher in pre-school. She was motherly presence through entire childhood. Jassa Bhaji. Started as gatka buddy and became good friend. Mutaytor performance group family. They helped me to open up and share my gatka skills with non-Sikhs along with honing my fire spinning skills. Baba Lance. I had a neighbor when living with parents whose name was Lance. He was an early influence on me for getting into Sikhi. He trained me at Sikh youth camps to use weapons. He introduced me to Native American religious philosophy. I asked Hargobind is there anyone else he wanted to extend gratitude towards. He did not say no. There was just tired silence. I felt he wanted to extend shukrana (thanks) to others as well including his family, the Nepons (maternal side of the family), and his friends. The folks he mentioned were from his most formative years. They served as his guides as he navigated from childhood to the world of adults. Hargobind had a complicated relationship with his step mother. I never discussed the details with him. At this point I asked him if there is anything he would extend as an appreciation for his step mother. He thought for a few moments. Hargobind worked for two outlets in New York City that catered to locally grown nutritious food. He was a consummate recycler and advocate for all things natural. To the other woman in his life who shared the last few years of his life, serving as his fiercest advocate, his primary carer, his soul mate, his wife, here are few choice words Hargobind left with me. Hargobind was at home with his wife and loved ones in his last days. His wife Dalveer was holding his hands on the morning of September 12th as we recited Chaupai Sahib together. Towards the end of this bani, Hargobind left for his heavenly abode. Hargobind embraced pain, suffering and impending arrival of death with grace, poise and no complaints. His gentle warrior presence enabled us to be more able carers. A special salutation from Hargobind and all of us to carers around the world who pour their hearts and minds in the care of loved ones and fellow human beings in need. Thank you Hargobind Singh for gracing us with your presence. Please consider offering your support to Hargobind's End of Life Medical Fund to cover expenses for his care in the last few months. Kirpan — Combination of two words: Kirpa meaning “Mercy, grace, compassion” and Aan meaning “Honor, grace, dignity”. Kirpan is a defensive weapon to defend the dignity and honor of compassion, kindness and mercy. Chaupai Sahib — It is a prayer composed by the tenth Guru of the Sikhs, Guru Gobind Singh Jee. It is an Ardaas (request) to the eternal energy (Waheguru) for protection. Miri-Piri — Miri and Piri are represented by two swords that represent temporal and spiritual aspects of a Sikh’s life. Darbar Sahib — Also known as Harmandir Sahib and Golden Temple, Darbar Sahib literally translates to ‘Guru’s Court’. It is the holiest of Gurudwara’s for Sikhs. 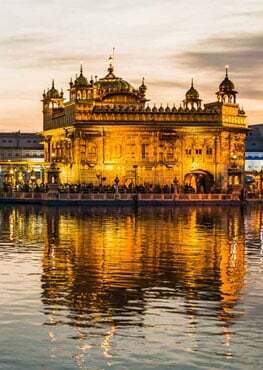 Amritsar — The city of Amritsar in Punjab, Northwestern India is home to Darbar Sahib and was founded in 1570’s by the forth Guru of Sikhs, Siri Guru Ram Daas Jee. 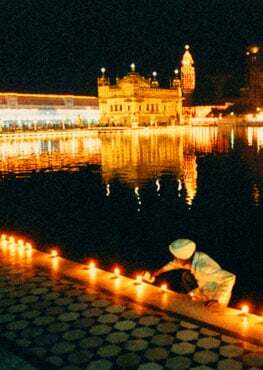 Amrit — The Baptism ceremony in the Sikh faith introduced in 1699 by the tenth Guru of Sikhs, Guru Gobind Singh.